Michigan's rivers offer fantastic spring steelhead fishing opportunities for anglers. Let Sport Fish Michigan's Captains and Guides provide you with a great day of fishing on northern Michigan's beautiful rivers! Michigan's yellow perch population is growing in both numbers and size. Our guided trips offer anglers the best equipment and electronics for catching yellow perch on Northern Michigan's inland lakes and Grand Traverse Bays. Vertical jigging for King Salmon and Coho Salmon on Lake Michigan - Grand Traverse Bays and Platte Bay. Book your hands-on, light tackle, vertical jigging trip with Sport Fish Michigan to experience the best Michigan fishing. For more information, or if you would like to experience the excitement of this hands-on, light tackle jigging technique, please give Sport Fish Michigan a call, or check us out on the web at www.SportFishMichigan.com. To experience the thrill of sight fishing for coho salmon, give Sport Fish Michigan a call today. 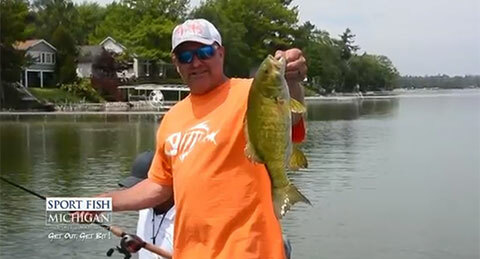 Hi, I'm Jeff with Sport Fish Michigan. We're on the river today. There's not too much of a hatch going, so we broke out the nymph rigs. We have a two nymph setup here. Both of themare tungsten bead head nymphs,. They're heavy, and they cut through the water and get down to the bottom in the strike zone really quick. That's key in this method. Our nymph rigs consist of a 10 foot 4 weight rod, with a specialized nymphing flyline, with a 12 foot leader. The first part of the leader is about a 6 foot section of 15 pound test. After that we attach a 2 foot length of 12 pound high-visibility mono-filament - that's our indicator. Below the indicator is our tippet system. There's about 3 foot of 4x tippet to our first bead head, and below that is about an 18 to 24 inch section of 5x tippet with a heavier fly on the end. Next time you're on the river give this rig a try, I think you'll like it. If you're looking for a Guide or a Captain in the State of Michigan, give Sport Fish Michigan a call - or look us up online at SportFishMichigan.com. Go fishing in Michigan's beautiful rivers for an unparalleled angling experience! Fishing for Cisco in northern Michigan with Sport Fish Michigan's Captains and Guides. Book your hands-on, light tackle, vertical jigging trip with Sport Fish Michigan to experience the best Michigan fishing. Doubles and triples! This is about the average size cisco here that we're catching on Grand Traverse Bay. Loads and loads of fun! Capt. Ben Wolfe fishing jigging for Michigan walleye in late February. Hi, I'm Captain Ben Wolfe with Sport Fish Michigan. It's the third week in February here and we've got a beautiful, sunny day. It's open water so we thought we'd pop down here to the Saginaw River and jig up some walleyes. We've got a lot of walleye in the system, a lot in that 8-12 inch range, but if you keep grinding through them, you can catch these nicer ones. We haven't had the main push of big walleye yet, but if you keep fishing hard you can still find some perfect eaters just like this. Fill up a cooler and get a limit, just like we've got today. Summer Fishing in Michigan tremendous opportunities to fish for smallmouth bass, lake trout, king salmon, and coho salmon... abundant in Michigan's beautiful rivers and lakes! Whether you're casting, jigging, or trolling, spring lake trout fishing in northern Michigan is always exciting and fun! Lake trout can be targeted on the Grand Traverse Bays, Lake Michigan, and select inland lakes. Traverse City Bass Guide Service and Sport Fish Michigan's Captains Ben Wolfe, Ron Dohm, and Chad Dilts go early spring bass fishing in northern Michigan. Catch and release smallmouth bass sight fishing! Here we go! Look at them all! That's one. Got it... oh yeah! There he is - nice bass! Got 'em. Nice smallie! Awesome! Look at that fish - nice one. Come here! How about that?! Yes sir - look at that! That's a good four pounder. Northern Michigan gold right there. For more information, or if you're looking for a Captain or Guide in the State of Michigan, please give Sport Fish Michigan a call, or check us out on the web at www.SportFishMichigan.com. For more information, or if you'd like to book a thrilling ice fishing trip with Sport Fish Michigan, please give us a call, or check us out on the web at www.SportFishMichigan.com. Fishing in Michigan during the spring season offers an exciting variety of species, including smallmouth bass, walleye, lake trout, steelhead, brown trout, and cisco... abundant in Michigan's beautiful rivers and lakes!